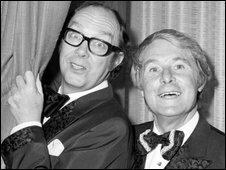 A newly discovered handwritten letter has revealed that Ernie Wise wanted to "break up the act" with Eric Morecambe. He blamed pressure at home, dissatisfaction with his work, and because he had lost his "zip". The two page memo, written around 1950, came to light as Morecambe's son Gary researched a new book about the comic, which is published this week. But Morecambe urged him to think again, Wise reconsidered and the partnership continued and became a great success. The note is understood to have been written long before they made their TV debut, but after they had made a mark on the variety circuit. In it, Wise made clear how much he valued his friendship with Morecambe. Wise wrote: "I feel it would be better if we parted. I know that this will be quite a shock to you but I had to come to some decision. "I can't go on as things are... I'm not satisfied with my work... I feel it's a great pity after we had planned so much." It is signed "your best pal". Gary Morecambe said: "I knew that Ernie had written the letter - my father had mentioned it to me before his death. "But it was only when researching this book that I found out it still existed. "I'm touched by Ernie's affection and respect for my father, it's almost impossible to believe that we could have been deprived of all the fun and laughter they brought to people's homes in the years following." The letter was given to Gary by his mother who had filed the letter. Gary said: "My father's response, he told me, was to write straight back basically saying he'd never heard such rubbish in his life and that Ernie should have a few days' rest to get over it and then they should get back to finding some work - which essentially is what happened." The pair were regulars on television and radio and went from strength to strength, ending up with their own programmes. Their TV shows continued until Morecambe's death in 1984. Wise died in 1999. The letter appears in You'll Miss Me When I'm Gone which Gary Morecambe has written to mark the 25th anniversary of his father's death.